How I Met Your Mother is a perfect example of a series that has gone on too long. Now in its eighth season, it’s hard to tell who among the cast and crew wants to get out the most. Is it the writers, who seem content on recycling old material? Could it be the cast, every one of which is now a bankable big screen commodity? I can’t say for sure, but if there’s one thing to say, it’s that this week’s episode is a strong candidate for the series’ shark jump moment. This argument begins and ends with Barney Stinson. I used to have this great thesis on how Barney is a modern day Achilles. He’s deceptively simple, but ultimately proves to be one of the few people among the cast capable of genuine character growth. Season seven and eight shot said thesis right in the face. In today’s example, Barney gets a dog; a dog which Barney puts in a suit and uses for a wingman. All we need now is a little romance, a bit with Ethel the Pirate’s Daughter, and we’ve really got ourselves a comedy, said Mr. Fennyman. 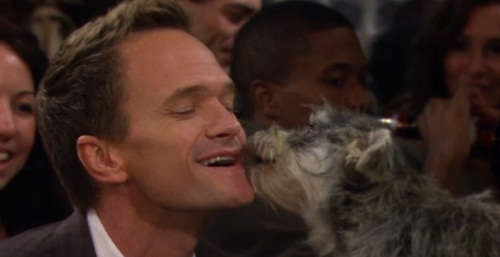 If there was ever something which screams, “We’ve run out of ideas.” It’s paring Neil Patrick Harris with a dog. Of course this isn’t simply about adding a cute factor to a smarmy guy intent on bedding wenches. Indeed introducing Mr. Stinson to a canine best-bro is a means of opening up the once healed, but now festering, wound of Barney’s abandonment issues. For the record, Barney’s now been in one less long-term relationship than Ted. To go down this road with any other character than John Lithgow as Barney’s father is tedious for the audience, retrograde for the character, and a lame excuse to make Robin more involved in Barney’s life. Because, spoiler alert, oh wait it’s not a spoiler because the show has already told us, Barney is going to marry Robin. Ted and Robin are both in relationships with other people; Ted’s involved with his season two girlfriend Victoria, and Robin’s having a thing with an overly sensitive Cylon (Michael Trucco). This week’s episode reintroduces fans of the series to an old friend: the “it’s weird that Ted and Robin are so close” trope. Ted’s and Robin’s friendship ruined Ted’s relationship with both Victoria and Stella, and guess what, now it destroys his second relationship with Victoria when she lays the “It’s her or me” ultimatum at Ted’s door. I have to admit, I’m starting to have a really hard time sympathzing with the self-sabotaging lovelorn Ted Mosby. Meanwhile Robin’s low-rent celebrity chef Cylon grows more and more annoyed with Robin’s tendency to drop everything for Barney and Ted. Now where have we seen this before…ah yes, Robin’s relationship with co-anchor Don. Therefore we must ask, what was the point of introducing the Cylon to the show? Did one of the producers owe Trucco a favour? Did market research indicate the ladies and gay men needed more eye candy? Since we know this is likely to be the series’ final season, and we also know Robin will be marrying Barney in the near future, and we further know Ted will meet his wife after said wedding, it’s pretty hard to view these relationships and their associated story as anything other than a pathetic attempt to stall for time. Then there’s Lily. I’ve never liked Lily. Time and again she’s proven herself to be a manipulative puppet master bent on influencing her friends into what she imagines to be their ideal life. Perhaps Lily’s most unlikable feature involves her history of sabotaging relationships of which she doesn’t approve. This week, Lily crossed the really creepy Rubicon from shadow master into…I don’t even know what she is now…Jeff Dunham? Drawing on the slightly effeminate vibe Marshall has always put out there, Lily takes it upon herself to turn her husband into a comically inept version of her perpetually advice giving self. In doing so, Marshall channels the voice of his inner goddess, a matronly, z-snapping Southern woman. Granted the freelance advice Marshall gives at the bar is hilariously inept, but it’s also a pointless gimmick which can be interpreted as the coup de gras in Marshall’s regression into an adolescent “I’ll be who the girl I love wants me to be” mindset. Where Marshall began the series a focused and dedicated law student, he has gradually slipped further from that point. In the wake of his father’s death, perhaps the audience could accept his temporary retreat to the safety net of his family’s Minnesota home. But now that Marshall has everything he wants in life, a job as an environmental lawyer, a child, and a wife, he should be self-actualized. Instead, he retreats from any sense of self into the machinations of his wife, thus demonstrating all the substance of a ventriloquist’s puppet. My wonderful partner Rebecca was quick to point out this week’s episode does see a return to the winning narrative format of How I Met Your Mother. There were no flash forwards to the future followed by a single plot thread of filler material. Rather, the writers gave us three distinct, but connected, story lines. Moreover, there was no focus on the “hard” life of being new parents (barf) as seen through Lily and Marshall. Despite this, I don’t know if these changes will be either consistent or meaningful enough to pull the show back from the edge of the abyss. Overall, I’m not impressed. When asked “Why do you keep watching the show, Adam?” my only answer makes me sound like a media Meth addict. Simply put, I can’t help myself. After seven years I’m too deeply invested to walk away from it now. Even though the quest to find Ted’s future wife has become so convoluted as to make the very act of revealing her meaningless, I want to know who she is. In spite of this sadistic compulsion to stay with the show, it’s hard not to look at this week’s writing and see How I Met Your Mother as anything but a sitcom which has run out of gas.